Nothing inspires less confidence than a protagonist who happens to be a struggling screenwriter. Yes, you are supposed to write what you know, but if that is the sum total of your experiences, maybe you were not meant to be the voice of your generation. Justin Daly probably knows a heck of a lot more about the business than his scuffling scribe character, considering he is the son of Pia Lindström and the grandson of Ingrid Bergman. 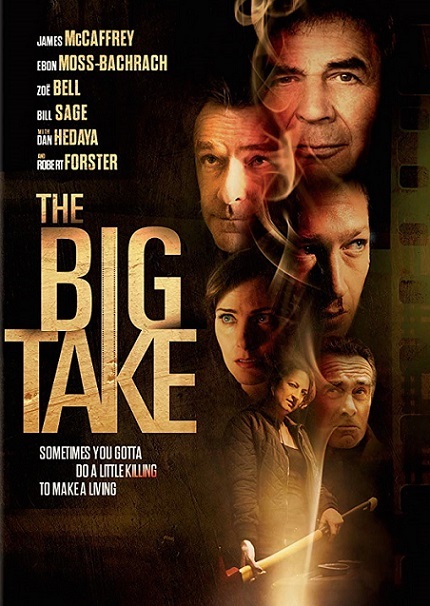 He must know some stories, but he creates some Elmore Leonard-esque business instead for his directorial debut, The Big Take (trailer here), which opens today in New York. Faded movie star Douglas Brown thought he was back on track. He successfully transferred all his finances to Panama to hide his assets from his ex-wife and lined up a reasonably budgeted film as a potential comeback vehicle. However, he could suddenly lose it all, after an unscrupulous aspiring producer walks away with some excruciatingly embarrassing CCTV footage. (Frankly, The Big Take could find itself on the receiving end of Social Justice Warrior wrath for transphobia, but it is still bad for Brown’s business). Vic Venitos had the bright idea of blackmailing Brown to appear in the film he is supposedly producing and to underwrite the $200K production budget, but he really has not thought this through. Unfortunately, he scrawls his extortion note on a page of the script, which leads back to his hopeful screenwriter-director, Max O’Leary. O’Leary is clueless about his producer’s activities, but through miscommunication and his Ukrainian wife’s surprising fighting chops, they manage to get the better of Frank Manascalpo, a fixer retained by Brown’s agent, Jack Girardi. Then things start to get ugly and personal. By far, the best thing about Big Take is the supporting cast of veteran character actors and genre journeymen. Bill Sage is wickedly droll as Girardi, while James McCaffrey is hilariously dissipated as Brown. The great Robert Forster seems to be trying to outdo his personal best for world-weariness as cynical West Hollywood Det. Aborn. Dan Hedaya is also instantly credible as the hard-nosed Manascalpo. Zoë Bell is appropriately sinister and even shows a little bit of the action chops she is known for as Edie, the hired killer. Unfortunately, Ebon Moss-Bachrach’s O’Leary is just a mushy nothing, right in the center of the film. It is always a pleasure watching old school cats like Forster and Hedaya do their thing, but Daly should have given them more outrageous one-darned-things-after-another to deal with. He matches the cynicism of Altman’s The Player and Katz’s Gemini, but not their wit and irony. Still, there is some sharp dialogue and some great work from the old pros. Probably a film you can safely wait to stream on Netflix or Shudder, The Big Take opens today (9/7) in New York, at the Cinema Village.